The Woody Minis may have been based on a mass-produced model, but as we discover, making their ash frames these days is something of a fine art. Regardless of how rose-tinted our spectacles become, we can never believe that the Mini ever was, or ever will be for that matter, a hand-built car in the traditional sense. The Mini was born out of necessity, to cater for a car hungry public suffering the effects of the Suez crisis. It was utilitarian, which is a polite way of saying sparsely equipped. On a car where function ruled over form, the addition of wood trim must have seemed to many, Issigonis included, no more than a marketing man’s folly. But from 1960 to 1969 you could order your Mini estate with charming wood framing around its rear quarters. But unlike earlier cars, such as the Morris Traveller estate, the wood work was purely cosmetic and had nothing to do with the structure of the car. It does make for a very attractive car but it must have presented many headaches on the production line where the workers were used to working with far more durable materials. 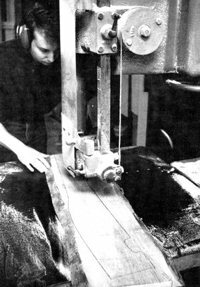 Wood will not take the same punishment as steel, and it certainly cannot be fettled into shape with a hammer and dolly. Fixing the first delicate wood frames must have lead to quite a lot of head scratching. Woody estates followed the path of so many other useful vehicles. Fashionable and with go anywhere appeal when new, they would have turned slowly into family hacks and useful load-luggers as the years and miles rolled by. The wood may have made the estate more attractive to potential new purchasers, but once the timber had suffered the ravages of the British climate, it would become more of a negative than a plus point. Damp wood held against the already vulnerable areas of the car lead to rapid rusting out and many Woodies made it to the scrapyard long before their less glamourous all-steel sisters. 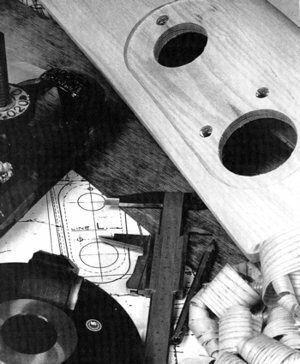 Recent interest in the woody estate has seen a fair few brought back from the dead, but although many Mini parts are readily available off the shelf, remanufacturing the wooden trim has been the preserve of a few dedicated specialists. Classic Car Woodwork are a fairly new company, but were born out of Dinefwr Joinery, a well established company. Run by father and son team, Ian and Michael Quelch, Dine-fwr joinery has been going for around 15 years in its present location in Wales. The move into automotive woodwork has been a fairly recent occurrence and the Classic Car Woodwork wing of the company was only rormed last summer. Both Ian and Michael are time-served joiners who have learnt their craft from older tradesmen. 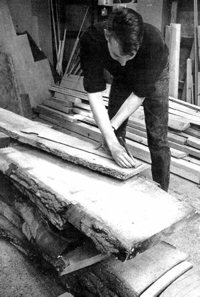 Ian was apprenticed as a joiner and cabinet maker in the ’50s, and Michael has followed in his footsteps and was, in fact, lan’s apprentice. Classic Car Woodwork is Michael’s brainchild. Why did the car makers originally choose ash? Michael explains: “It’s relatively easy to shape. It also has a natural spring which you need when it is fixed to a car body which flexes a lot. Plus, it looks good when it’s finished.” The Quelches also believe ash was chosen because it was readily available in the Midlands. With over 200,000 Mini Countrymans and Travellers alone, there can’t have been too many ash trees left by the ’70s. From the moment the timber arrives at the workshop and at every stage through the manufacturing process, it is carefully inspected and checked to make sure the individual piece of wood is suitable for the job it will finally do. For instance, the wheelarches cannot have the grain of the wood running directly across the narrowest point. If this was the case, once the wood was fixed to the bodywork of the car as soon as the bodyshell flexed the wood would crack and split. As a result of this, it can be a very wasteful process. It is not an exercise in making as many components of the frame out of as little timber as possible, but making sure that the finished frame will be strong and good looking. “It’s a natural product and you don’t know what you’re going to get until you start to cut into it,” Michael points out. Since development work began on the Mini kit, Ian and Michael have had to make around 70 jigs alone, plus the templates for marking out the individual com-monents. “There will be around 100 jigs by the time we’re rinished and happy,” says Ian. These important tools are used 😮 make the 32 separate pieces of timber which make up a full Mini kit. A few of the components cannot simply be cut to the shape of the bodywork but have ko be steamed. This makes the timber flexible and allows i: to be bent to [shape, for instance Ithe section which runs down the rear corner of the car and has the rear lights fixed it. 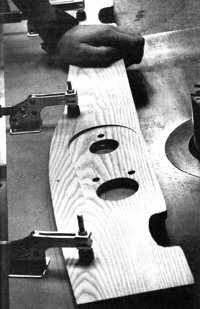 The component is then placed in a jig to dry and set to shape. The kit is delivered to the customer as a flat pack, unvarnished, but it will have been finish sanded just before it’s ready to go out. “It has to be in top condition when it leaves,” says Michael. This is the one area of concern for the Quelches. The frame must be glued and screwed together by the customer. It will then require a final sanding and varnishing before it is fitted to the car. Both Ian and Michael know the value of patience when working with wood but are not convinced that everyone else does. “It’s up to someone else entirely to put our work together, which doesn’t do our work any good at all if it is badly done,” explains Ian. But looking at the finished sample frames in the workshop and the care which both father and son invest into each piece of wood they work on, they have little to worry about. Early kits which have been sent to customers have encountered no problems. They have gone together as easily as you would expect with any component made to the original drawings, and fit easily to the car. The car to which the wood is to be fitted is more likely to be out of true than the finished frame. 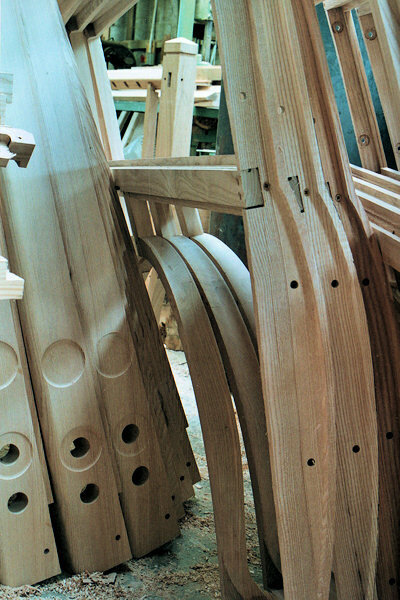 The final endorsement for the quality of Classic Car Woodwork’s products has come from British Motor Heritage, who are the sole distributors of the ash frames through the Heritage special network of approved companies.